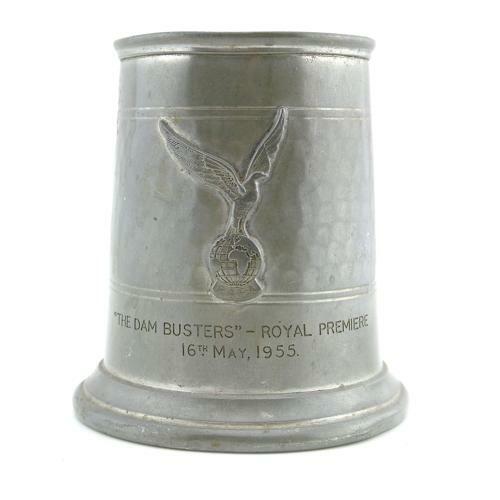 Tankard created for the Royal Premiere of the classic film 'The Dam Busters'. This took place on 16th May 1955 at the Empire cinema, Leicester Square, London and was attended by survivors of the raid along with actors from the film including Richard Todd who played 617 Squadron CO Wing Commander Guy Gibson. Alexander Gibson, Guy's father also attended as did Air Commander Mills (then the new chief of Bomber Command), Lord De L'Isle Dudley - Secretary of Sate for Air, Dr. Barnes Wallis, Lord & Lady Tedder, Air Marshall Sir Robert Saundby and Her Royal Highness Princess Margaret. It is beleived that tankards like this were presented as gifts to invited guests. The tankard was created from hand beaten pewter in Sheffield, England, stands approximately 9.5cm tall and has the Royal Air Force Association badge to the front. Engraved beneath are the words 'The Dam Busters, Royal Premiere, 16th May, 1955'. Overall condition is good although pewter is soft and there is some minor distortion and denting. An extremely rare find. Stock code DRFKM.